"Nine Dollars for a Ginger Ale!?" Elijah was unable to join us for our fourth game of The Al-Qadim, but we were joined by JADE Guest Chris for his very first game of Dungeons & Dragons! Always exciting! We left our adventurers standing out front of Zubayr ibn Nijad's (Dave) tent. Nyrexes ibn Tamir (Jeff) had just awoken from his resurrection, and found his twin brother Husam ibn Tamir (Elijah) and Zubayr planning their next moves. 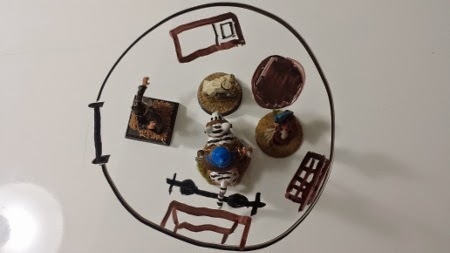 In Al-Qadim Game 3, Shams, the Qadi of the local slave market, had told the party how the master thief Nefir had appeared out of no where, and was slowly taking control of Qudra; the most heavily fortified city on the continent. Shams told them that a clerk in the customs office seemed to have more information about what was happening, but Nefir's men ahd barred him entry, preventing him from learning the truth. He asked the group if they could find out what the clerk knew. The twins feared for their home town, but Nyrexes' scuffle, and unfortunate demise in a fight with assassins sent by Nefir to silence Shams, had left them shaken. Would they enact their vengeance against Nefir and discover his plans, or would they leave the city and return when they were more powerful? Scene 1 A Man Changed. Decisions. Nyrexes' resurrection had changed him. In death he had found the peace and tranquility he had been searching for in life, and this fact disturbed him. He swore to himself that he would find that peace again, and began to believe that only the magic of a powerful Djinn could give it to him. Thus his obsession with becoming a powerful Sha'ir grew. And his alignment changed from Chaotic Good to Chaotic Neutral. It was agreed that the best course of action would be to leave Qudra, and seek their fortune in the desert. They all felt that Nefir was too powerful to deal with at the moment, and staying would probably mean their imprisonment or worse. So, they would leave the city, and deal with Nefir when they returned. Zubayr was surprised at Nyrexes and Husam. He figured they would want vengeance against Nefir, the man that had slighted their honour, and couldn't understand why they were leaving. However, he was happy to return to the desert. Nyrexes and Husam, had every intention of dealing with Nefir, but the brothers were thinking long term. It was no longer safe for them in Qudra, and they would need all the strength they could muster to deal with what power Nefir had used to take control of the City of Power. Scene 2 The Askar by the Gate. The party had bought most of their supplies the previous day; however, most of it lay around the city, in the care of various merchants. But, anxious to leave, they headed towards the stables, on the north side of the city gates. The gates of Qudra. Complete with tents, and a fountain. The streets leading through the gates were bustling with activity: Riders, caravans, pilgrims, and travelers, coming and going, from the City of Power. Mamluks stood in towers and patrolled Qudra's walls watching for any signs of danger or trouble. However one man seemed to have been missed by their vigilant eyes. He was dressed in the simple cloths of an Askar and had a worried look on his face. Nyrexes thought the man might have something interesting for them to do, so he approached him and asked who he was and if he needed any help. The Askar responded that his name was Hakim ibn Optical (Chris) and that he was seeking warriors to help defend his village. He told him that four people from his oasis village of Kafra had gone missing, and they suspected they had been taken by a Heway that had moved into the Oasis. Hakim was the only Askar in the village, but having never actually fought anyone before, the village priest had recommended he travel to Qudra to seek help. Zubayr had been to Kafra once or twice before, and knew that they village lay 24 hours out in the desert along the Sea of Caravans. He felt it would be an simple enough task to get there. Hearing this, Nyrexes was interested, but was not willing to travel out into the desert for nothing. He asked Hakim what his village would give them in return for fighting the beast. The villagers of Kafra had given Hakim all they could spare for the Journey to Qudra, and that had only amounted to two silver pieces and thirteen copper pieces. He had spent all of the money on food while he was in the city and thus didn't have much to offer him. And that is where our Quote of the evening comes from. Commenting on how expensive everything was in the city, Chris jokingly blurted out "Nine Dollars for a Ginger Ale!?" Which is of course from the hilarious sitcom Workaholics. The Twins and Zubayr were not impressed with Hakim's lack of money, and almost left him to find someone else. However, Hakim had one bargaining chip: he told the adventurers that Kafra's temple had an emerald statue of a Winged Serpent, and that he had been given permission to trade it for help. With the offer of treasure on the table, the party agreed to accompany Hakim to his village and help him fight the Heway. Before they left, the four gathered their three Camels, giving one to Hakim to ride, and filled their water skins. With their supplies secured, the twin Sha'ir's left the city for the first time, following Hakim and Zubayr to Kafra. Scene 3 The Desert, Sandstorms, and Bandits. As the hours wained, the Walls of Qudra became increasingly distant until they disappeared over the horizon. 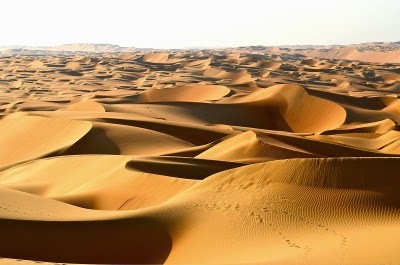 Then only the sea of dunes remained, broken to the south by the distant peaks of the mountain that guide the Sea of Caravans to and from the Pearl Cities. Zubayr and his Tiger Abed, where elated to be back traveling the desert they called home. The walls of a city or village may be good enough for the Al-Hadhar, the city dwellers, but Zubayr was an Al-Badia, a desert Nomad: he could never understand why anyone would want to stay in one place for so long. After several hours in the desert, the winds began to pick up. the Twins didn't realise anything was wrong, and welcomed the cooling breeze, but Zubayr and Hakim knew better. They quickly scanned the horizon for a incoming sandstorm, and found one towards the North East; moving fast. Zubayr checked his surroundings, and found a large rocky outcropping they could all hide behind and yelled for the party to run. Just as they made it to the rock face, the storm hit and blew over head for a harrowing 5 minutes. Hakim and Zubayr were pleased that the storm was only a short one, While Nyrexes and Husam were more shaken with their first encounter with the desert. But knowing the need to go on, the four continued on their way, and the next few hours were full of sand and the sun as the four continued towards Kafra. At what Hakim determined was two o'clock in the afternoon, the monotony of the dunes was broken by a black speck on the horizon. Pausing for but a moment, the party continued, keeping their eyes on the speck until it grew into two horsemen. They were riding fast at them, scimitars drawn. Fog in the desert; an unorthodox way to break a charge. Nyrexes asked his Gen to fetch him a Fog Cloud spell, which he then used to conceal the party in a thick murk. This stopped the charge of the horsemen, who were startled by the sudden appearance of Fog in the middle of the desert, causing them to holted their mounts; skidding to a stop at the fog's edge. The party heard the riders circle the cloud and then slowly make their way into the thick. The Riders could see nothing in the fog, but neither could the party. Nyrexes and Husam fired several Magic Missles in nain, missing each time, while Hakim and Zubayr stormed around the fog, hunting the riders. Out of the six men in the murk, Zubayr was the first to see his target. He and his tiger charged at the shadow, and struck one of the riders from his horse, impaling him with his spear. As Zubayr pulled the shaft from the rider, it seemed the fallen rider would stand and fight, but making it only to one knee, he collapsed; blood gushing from his chest. Hakim, was not so successful and tried to move back to his comrades, only to get lost in the fog. It was then that they all heard the great cry of a horse, and the sound of a man crashing to the ground. The party readied themselves for the worst, but the fog cleared revealing that the horse had tripped and broken its leg. Its rider stood and grabbed his scimitar, charging at Hakim. The Askar deflected the blows with his axe and backed away from his attacker, giving Zubayr room to attack. But, as Zubayr and his tiger leaped at the man, the bandit slashed the gnome with his scimitar, the blade biting deep into him. Hakim sees his chance to slay his first foe. While the bandit had his back turned, Hakim rushed at him with his axe, and in one mighty swing decapitated him. The fight was over, and Hakim had made the first kill of his career as an Askar. Searching the bodies of the men and the horse revealed only three silver pieces, but Nyrexes figured they could get more. One of the horses had run off into the desert, but the other one lay lame and squealing. They could use it for meat. Nyrexes tried to put the animal out of its misery with his knife, but he couldn't bring himself to do it; he was not a harden person but the son of a rich man, and this was a little beyond him. Zubayr sighed at the city dwellers squeamishness and killed the beast with a swing from his scimitar. 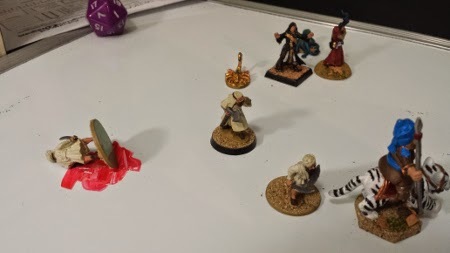 After Zubayr had cut the horse into pieces, the party realized they had forgotten to bring the firewood Nyrexes had purchased in Al-Qadim game 3, and had no way of cooking their meat. They tried a number of things, from burning clothes to growing trees in the desert with priest magics, until they gave up and continued their travels, leaving the grizzly scene behind them. The rest of the day was uneventful and as the sun set they readied their tents and camped out for the night. Scene 4 The Long Storm. The Village of Kafra. The following day Hakim awoke to find a scorpion resting on his leg. Calmly he pushed it off and then crushed it with his axe. So are the dangers of the desert, and Hakim was no stranger to them. The rest of the party awoke and they agreed that they would reach Kafra before their next rest, though it lay 16 hours away, and prepared to depart. They packed up their supplies, drank some more water and mounted their camels. They had a long trip ahead of them, and would not reach Kafra until well into the night. 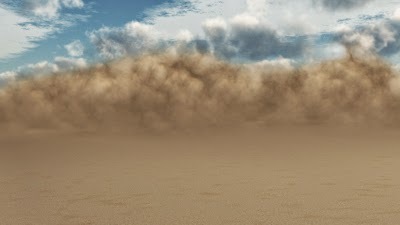 They traveled for most of the day until the wind began to howl and the sand from the dunes blew up in clouds around them. A sandstorm was building on the horizon, and there was no shelter in sight! Using his wits, Zubayr instructed everyone to take refuge under the tent fabric and hold them tightly around themselves, covering their face and and protecting them form the winds. The brothers thought it was strange, but agreed and the group prepared to weather through the storm. Zubayr's quick actions probably saved their lives as the wind and sand howled for almost an hour before it ceased. Sandstorms Deal 1d2 damage per round. This one lasted 40 Rounds. Gross. When the stormed was finished, each member found themselves buried under the sand! The storm had moved a dune on top of them, and its weight was pressing down. Zubayr Abed, and Hakim, manged to free themselves, and with a quick search rescued Husam and Nyrexes. The Camels, then rose from the sands around them, shaking the excess from their bodies. The rest of the day went without incident, and they arrived in the Village of Kafra around 2 O'clock in the morning. Kafra has Around 80 people in it, and rely on wool from their sheep, and water from the oasis to survive. Feeling it was important enough to roust the town, Hakim ignored the late hour and called out that he had brought the warriors they needed. The town priest and a few villagers came out to greet the party, thanking them for their assistance. Nyrexes went straight to the point, asking the preist about their payment, and demanded to see the emerald statue of the Winged Serpent. The preist was a little sad to part with it, but understood the necessity; he could only fight off the heway by blessing the water for so long, one day he would slip up and some one would die. it was worth the treasure. 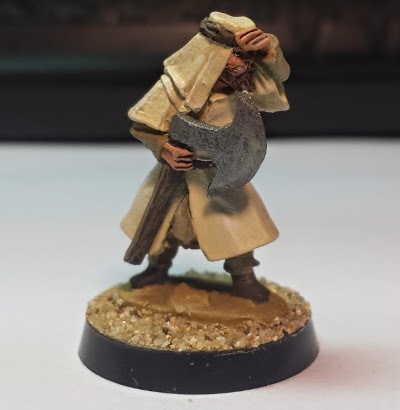 The priest showed Nyrexes the statue, who "jokingly" tried to pocket it, but some stiff words from Hakim made him return the statue, and begrudgingly apologize. With the price agreed upon, Hakim told the townsfolk that they would rest and deal with the Heway the following morning. He then invited the Brothers and Zubayr to his home for a meal and a rest, which the group happily agreed to. Scene 5 Fighting the Heway. They had intended to get up as early as they could the following day, but each of them was exhausted from their long trip through the desert. At 11 o'clock the following morning Hakim was awoken by the screams of the townsfolk. Hakim Rushed from his bed, to find a mother and father from the village sobbing outside his house. They were screaming that the Heway had taken their child! A Heway. Chaotic Evil. Poisons Oases and Eats what drinks from it. Doesn't normally Attack people in their homes. Hakim got the others and the party rushed to the scene of the of the attack. The mother explained that they woke up this morning and found their child missing, and that a trail of mud lead from their child's bed, out of their house, and towards the oasis. To Hakim, the mud didn't look like foot prints, more like a continuous trail. 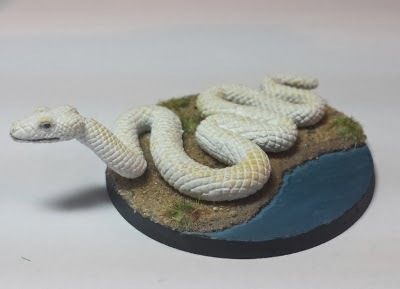 It could have been a snake, and having never encountered a Heway, Hakim was just as afraid as the townsfolk were, and ready to believe anything. 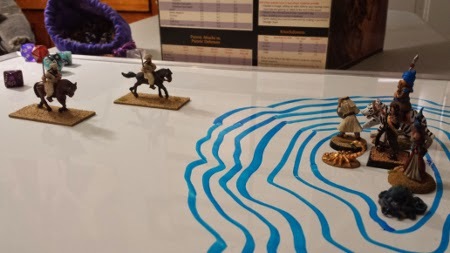 So he declared it was the work of the Heway, the Party followed the mud trail to where it slipped into the oasis. Feeling the beast was in the water, Nyrexes cast asked his gen to fetch him a Water Breathing spell. It returned in a couple minutes later with the spell, and he cast it on himself and jumped in. The water was murky and he couldn't see anything, but continued to swim around searching for some clue to the snake's whereabouts. 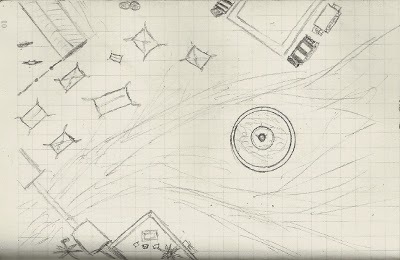 The rest of the party, walked around to the other side of the oasis, where the hole the snake had dug as its lair lay. 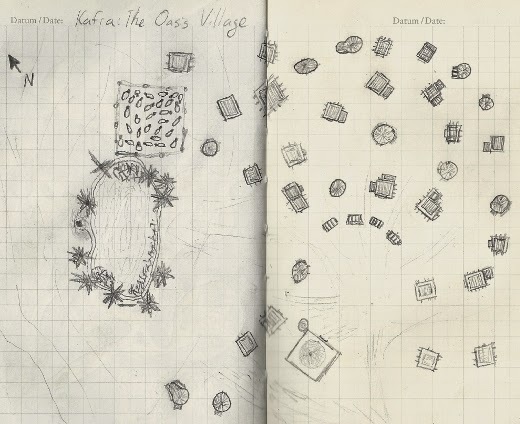 The entire village came out to watch as Nyrexes emerged from the oasis and launched a Fireball into the Heway's lair; hoping to draw the creature out. It worked. 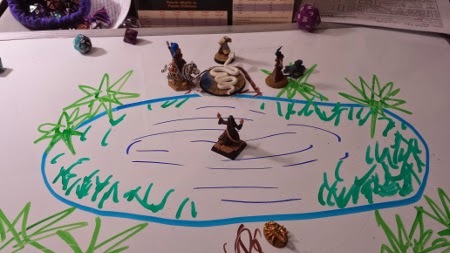 The fighters and Husam backed away from the edge, and Nyrexes dove back into the oasis as the snake slithered out of it's layer, slightly singed and very angry. 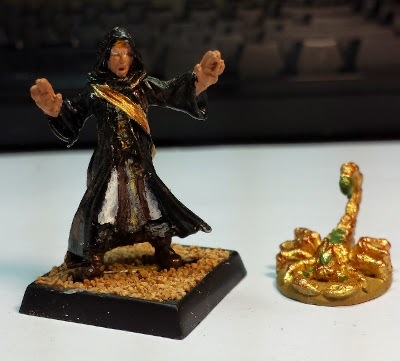 The Heway tried to use it's Hypnotic Stare to paralyze Hakim, but the Askar was determined to save his village, and would not be taken by the Snake's tricks. He broke the creatures gaze and swung at it with his axe. His shot was a criticaled hit! With a mighty blow form his axe, he split the creature's head in two, killing it instantly. He was a lucky a Djinn didn't hear him (and the town ignored him), such boasting in the Land of Fate can be more trouble then it is worth. The towns priest thanked the heroes for their service, and asked them to stay and rest in the village while they prepared a feast in their honour. Graciously they accepted, and that was where we ended the night! Finally the Tamir brother's had a victory. Their moral was starting to waver, but defeating the Heway and saving a whole village should be enough to bolster their confidence. Our Desert Rider and Askar were more then enough to deal with the Bandits and the Heway, rolling multiple criticals, and almost nothing lower then a 15 for the entire game. Waffled Earn Guys you all killed this one. Next time we open with a relaxing day in Kafra and a feast in the player's honour. Remember when people compliment you, politely refuse, or underrate your skills. There is always a chance a nearby Djinn will over hear your boast and curse you with an Evil Eye, which is not good.